Can we get a volume knob on the new touch screen please for the audio system? For 2014 Honda made some nips, tucks and added some visual flair to differentiate the coupe version of the Civic from its more grown-up looking sedan sibling. Whereas the sedan has a tasteful and elegant chrome ringed nearly trapezoidal grille, the coupe uses three smoked gray slats in the grille to add a sense of visual menace. The tail-lamp design for the coupe is also updated and makes the two door actually look like a much more cohesive design overall compared to last year. As for the Civic sedan, we liked it last year, we still like it this year. The quality of the 2014 Civic's interior is truly unimpeachable with nary a complaint about materials or build quality. This inside of a brand new Civic feels like it will look exactly the same 10 years down the road and from past experience they usually do. But as we tested the coupe version of the Civic, we did find that getting into the back seat was an act of gymnastic contortionism for this 6 foot tall road tester. Only the passenger seat slides forward for back seat access which seems silly to us and even with that seat pushed all the way forward the space left to get back there is narrow and the roof low so we hit our head a couple times. We are also loath to admit that during a photo session with the car we managed upon exiting the back seat to get our foot tangled in the front seat belt and do a major face plant into the concrete. In front of four passing joggers who did their best to hide their laughter at our epic fail. 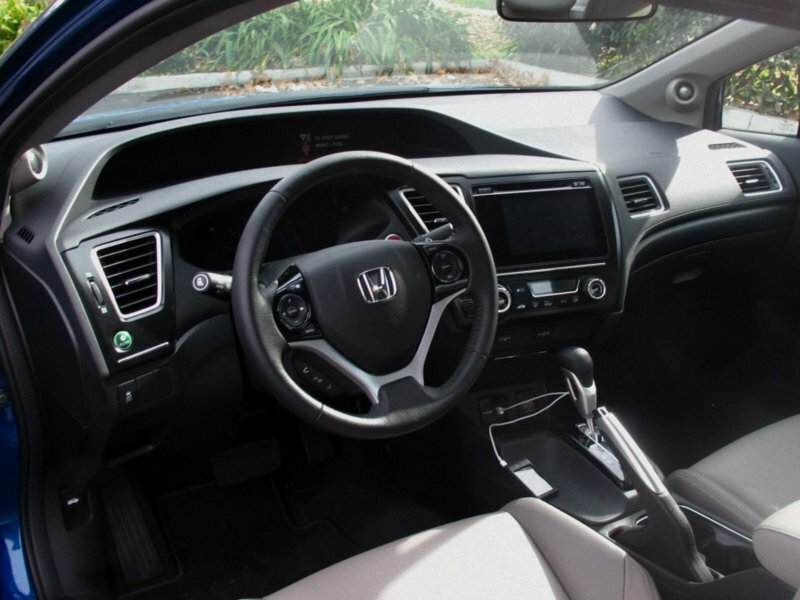 Up front, the Civic is the picture of comfort and all controls are easy to reach with the small i-Mid screen atop the dash proving to be extra handy as it can display your audio information, phone info and also tells you when to turn when you are using the optional navigation system. It helps you keep your eyes on the road. Our biggest complaint, however, is with the new 7-inch touch screen interface which instead of having a traditional volume knob has a touch activated sliding scale for volume adjustment which we found impossible to use reliably. Thankfully the Civic comes with steering wheel mounted volume controls so it is a problem we got around. Seriously Honda, some people are old and still need a volume knob. Despite our qualms with the new Civic's touch screen and it's lack of an easy to use volume knob, otherwise the system is state of the art and very easy to use. Not only does it allow clear, easy to use access to things like your smartphone's phonebook, the music on your iPod, a very informative fuel economy tracker as well as serving as an easy to see camera screen when backing up or changing lanes. Our favorite high tech safety feature that is a Honda exclusive is the Lane Watch System which uses a camera in the right side mirror to show the next two lanes beside you when you activate the turn signal. Brilliant. 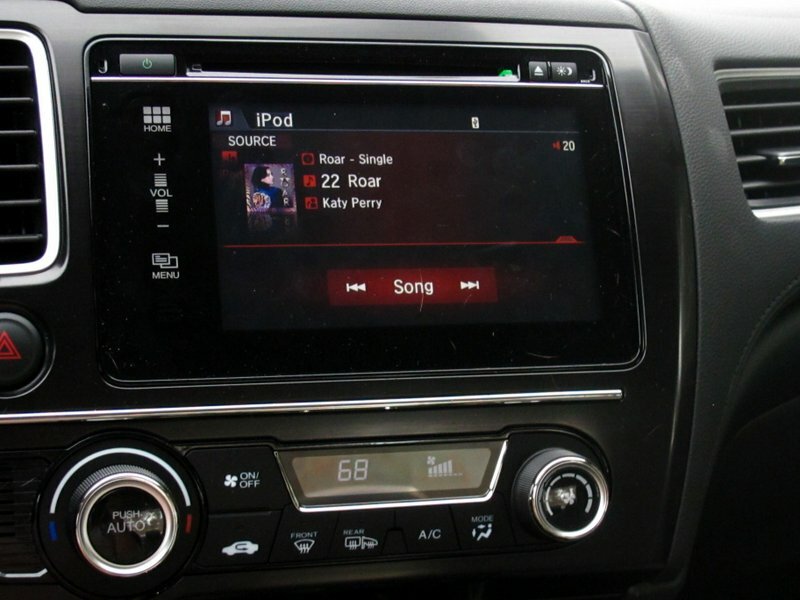 The touchscreen also offers access to features like Pandora, a system that will read back your text messages to you and is also where the optional navigation system lives. 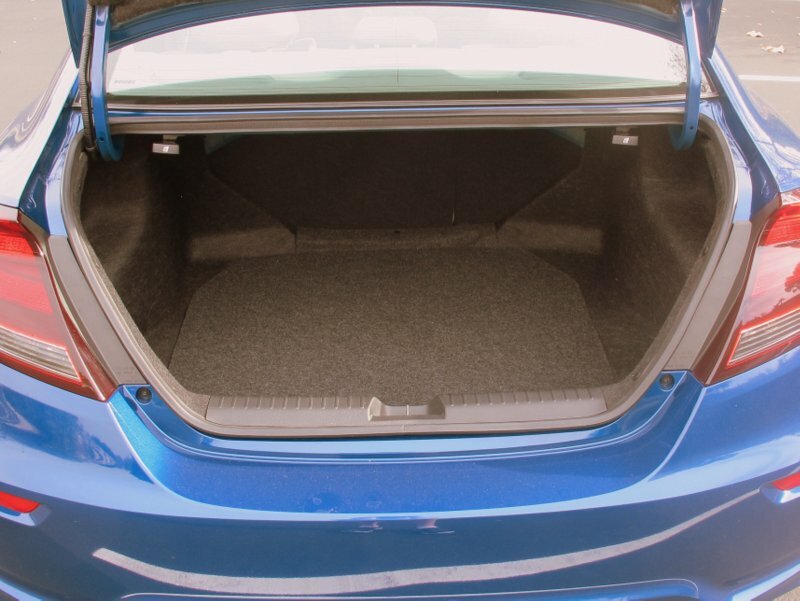 Our 2014 Honda Civic EX-L boasted the uplevel 360-watt 7-speaker and a subwoofer which performed on the level on the systems we have tried in the Civic Si and top trim Accord models. That is to say, the Civic Coupe EX and EX-L with this 360-watt not only come with an affordable car but they also managed to pass our very difficult audio test which nearly 70% of new car systems fail. Do note that all sedan models (barring the Si) make do with a lesser 6-speaker 160-watt system so you may want to make some aftermarket upgrades there if you like your music loud like we do. Our 2014 Honda Civic EX-L coupe has an EPA fuel economy estimatation of 29 city/38 highway on regular unleaded gasoline with a fuel tank of 13.2 gallons. This is down one mile per gallon on models just equipped with the CVT automatic only but EX and EX-L coupe models feature a sport mode for the CVT and paddle shifters which can be used in either "normal" mode or "sport." Over the course of a week of varied highway and city driving we averaged a respectable 33.8 miles per gallon. The only compact car we have tested that bettered that number was the 2014 Mazda3 with 39 miles per gallon as tested. Well, duh, it's a Honda Civic people. But if you must have proof, just ask J.D. Power and Associates who know a thing or two about quality. 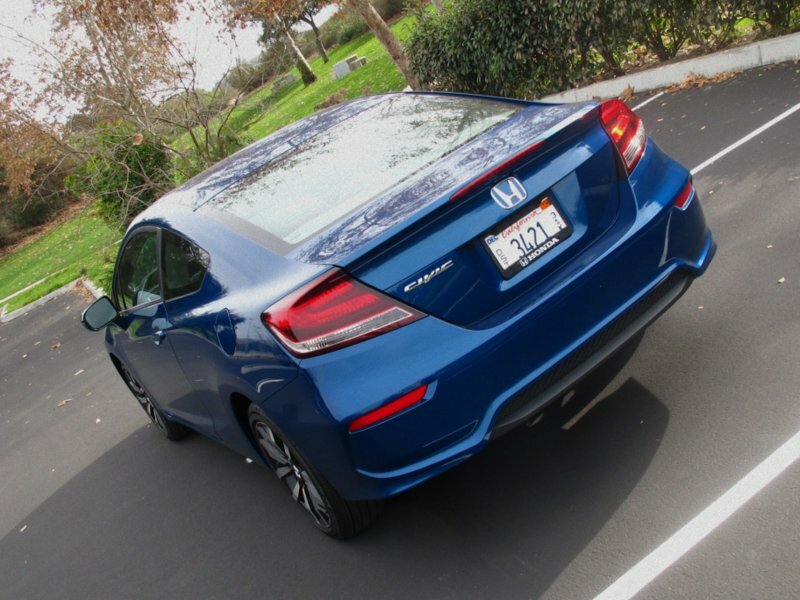 Not only did the 2014 Honda Civic coupe win an overall Quality Award in the compact car class but it also got 5 out of 5 as its score in overall quality and 4 out of 5 for predicted reliability. Civics are so well known for their reliability that they consistently enjoy the highest resale by far in the compact car class. 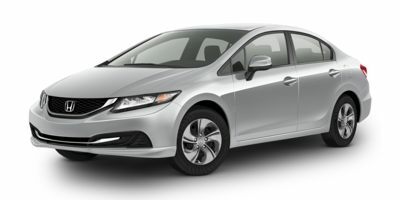 In addition to the unimpeachably happy Honda Lane Watch Assist System, the 2014 Civic also bears the distinction of only being one of two compact cars to score the coveted "Top Safety Pick Plus" rating from the IIHS (the other one is the 2014 Mazda3). In order to get this rating, the Civic must not only pass the usual front offset, side impact and roof strength tests but also one that simulates something like the vehicle impacting a pole or tree—something which happens more often than you might think and is the most fatal type of road accident. But the 2014 Honda Civic sailed through this test with flying colors and you can even watch video of the impact on Honda's U.S. website when you look up the Civic. It's Honda.com if you couldn't figure that one out. First off, we are saddened that the only current Civic models to offer the option of a manual transmission are the LX and the admittedly hugely fun to drive Si sport sedan and coupe. We do remember a time, however, when buyers of EX and EX-L models could also pick the option of owning a Civic with one of Honda's world renowned sweet-shifting manual gearboxes. As you can buy a 4-cylinder Accord sedan and coupe in a plethora of trim levels with a self-shifter, we wonder why Honda has seemingly abandoned the transmission in the Civic. Surely there would be an even higher take rate for manual transmissions in the Civic which attracts more frugally minded buyers so we hope someday Honda reconsiders. Our main reason for wanting a gearbox option was our semi-lukewarm response to the CVT automatic in the 2014 Honda Civic—odd, since the CVT automatic in the Accord is truly one of the finest of its kind in the world. The Civic's CVT is admittedly better than most others but at times on the freeway we found that when we needed an immediate bit of power from the still sweet sounding 1.8 liter 143 horsepower/129 lb. feet of torque 4-cylinder VTEC engine, there was a pause and hesitation before it responded. We only found this out on LA's precarious 405 freeway when a Prius driver must have dozed off and veered right into our lane. Thankfully, the Civic still steers and handles so nimbly and capably that we were able to safely swerve out of the other car's way, slow down with the solid brakes and then swerve back into our lane without losing control of the car. After that, we found that putting our 2014 Civic EX-L in sport mode and/or using the paddle shifters cut a couple seconds off of our acceleration times from 40-60 and 50-70 miles per hour. In normal around town city driving we found that the CVT responded smoothly and always provided the power we wanted so perhaps it was our tester or the gearbox just needs a bit of a software update (our tester was an early production model). We also might never have noticed anything had that Prius not decided one lane was enough and that it wanted ours as well. Most new owners of the 2014 Civic would never notice this and our nitpicking might also perhaps have something to do with how many Civics we have driven over the years which is to say many. 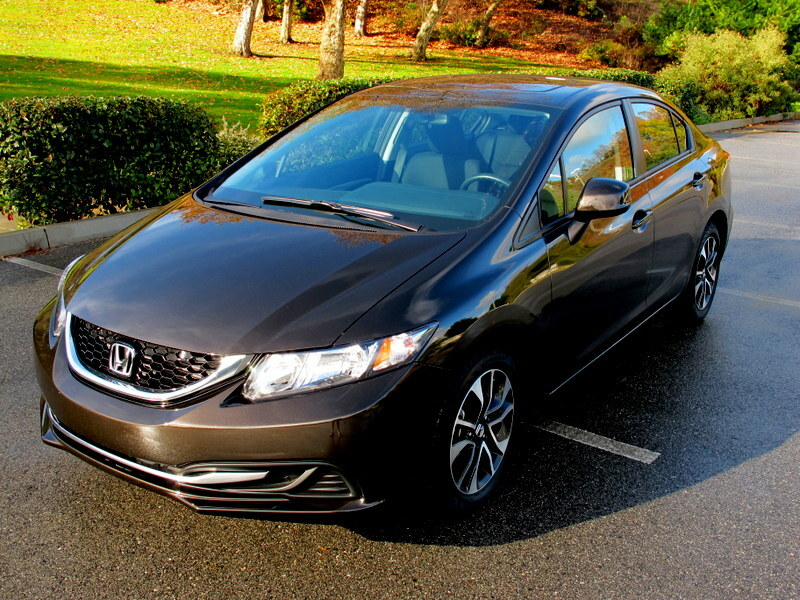 Otherwise, the 2014 Honda Civic EX-L proved the perfect companion for any trip be it a short jaunt down to the grocery store or long cruises on the freeway where it proved to be truly exemplary when it came to low tire, wind and road noise. 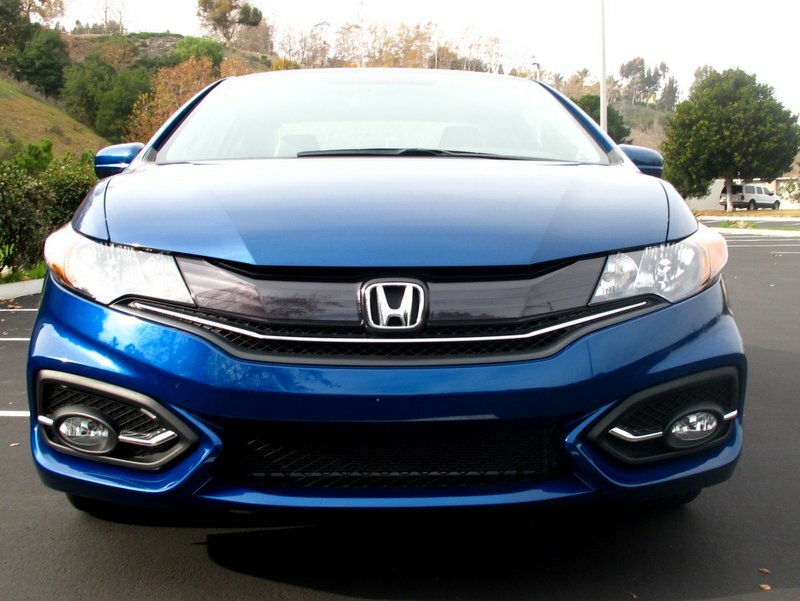 The steering calibration on the 2014 Civic coupe is near perfection with just the right amount of feel and smoothness. The ride soaked up bumps and potholes like a much larger car. 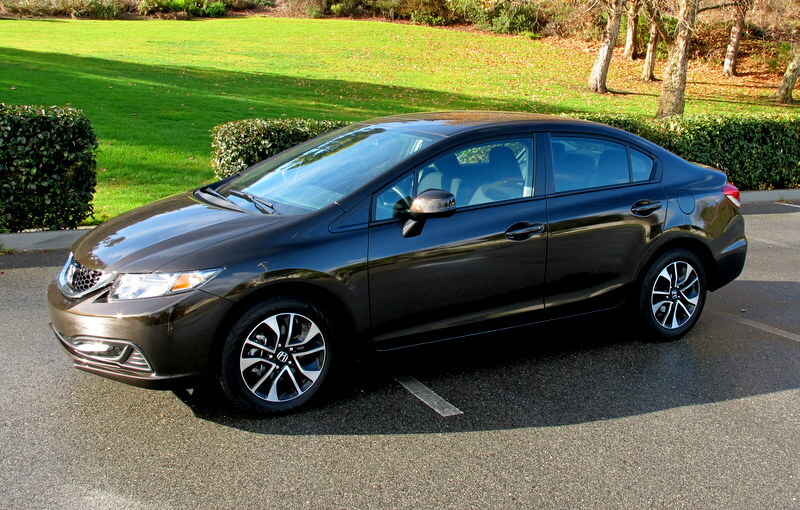 As always, the 2014 Honda Civic just drives like a much more grown up car. Honda doesn't offer options on the Civic exactly, but rather offers it in trim levels ranging from LX, EX to EX-L and lastly EX-L with navigation. Our 2014 Honda Civic EX-L coupe stickered for an incredibly reasonable $22,540 (sedan EX-L is $200 more) and this included leather seating, automatic climate control, power windows and door lock, keyless entry with push button access and start, the CVT automatic, Bluetooth, 2 USB ports (one in bottom center of dash, other in the large covered center console), a back-up camera, stylishly aggressive looking 17-inch alloy wheels, a power moonroof, heated front seats and side mirrors, a power driver's seat, halogen headlamps, Honda Lane Watch and the 360-watt AM/FM/CD/i-Pod compatible/Bluetooth streaming audio system accessible via the rather large 7-inch center mounted high resolution screen. That's more for your money than you get at Kia. The 2014 Honda Civic in any of its many guises always makes for a smart, affordable buy that any owner will enjoy driving for the many years he or she owns it. This model year we just marked it down slightly for some qualms with the CVT automatic transmission, the limited availability of manual transmissions as well as the lack of a volume knob (we admit, that last one may just be us). Otherwise, the Civic remains a smooth riding, agile handling, fuel efficient and stylish compact car that truly leads the pack albeit closely with one other model that we recommend you test drive as well—the 2014 Mazda3. Otherwise, you really can't beat a Civic. On one final note, we also do really like the 2014 Volkswagen Jetta with its new, fuel efficient and very powerful 2.0 liter turbocharged engine, the stylish 2014 Kia Forte as well as the 2014 Chevy Cruze which stands as a perennial favorite. With so many choices we wonder why anyone would choose the 2014 Toyota Corolla. Also recommendable are the 2014 Ford Focus and 2014 Dodge Dart which are quantum leaps in improvement over their predecessors. Interested to see how the 2014 Honda Civic ranks against similar cars in terms of key attributes? Here are the 2014 Honda Civic rankings for MPG, horsepower, torque, leg room, head room, shoulder room, hip room and so forth.